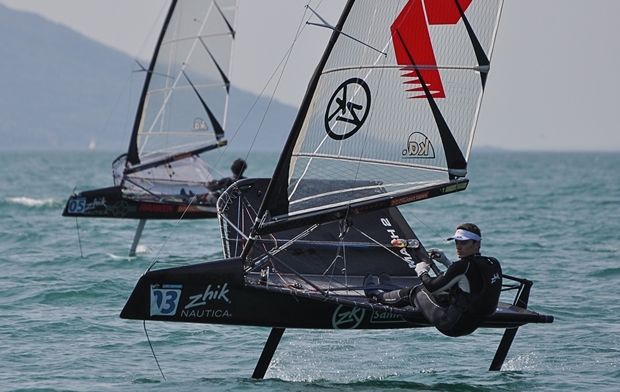 Aussie sailor dominating Zhik Moth World Championship. PLUS video! With no racing on day two, the wind returned with a 25 knots and 1m waves on Lake Garda for the morning of day three of the Zhik Nautica Moth World Championship, giving way in the afternoon to the dwindling Ora wind. These variable conditions seemed to make no difference to Australian Scott Babbage, who posted three bullets, in the first three of today's four races. Overall this leaves him nine points clear of second placed Anthony Kotoun, who proved to be a master of the light to moderate local Ora afternoon breeze. Comfortable in these conditions, the US Virgin Islands sailor pushed Joshua McKnight down to third overall with Bora Gulari (USA) and Joe Turner (AUS) completing the top five. conditions off Campione del Garda. And so in the big breeze there was plenty of capsizes, crashes and swims. But this separated the men from the boys. In the Yellow fleet, Babbage led from start to finish while in the Blue fleet there was a fight between Joshua McKnight, Joe Turner and Rob Gough, the latter scoring his first victory so far. When the race committee gave the signal for the second race, the Pelèr was already fading and shifting. Although still fresh, the lighter breeze and the flatter seas didn't provide the same amount of excitement. Once again, Scott Babbage dominated the Yellow fleet with Chris Rashley coming second behind him. Although Babbage has denied the young British sailor any race wins his consistent performance has allowed him to make inroads to climb into the top five. After a break ashore to wait for the Ora to build, the fleet took to the water for two more races. For the Yellow fleet, the third race of the day was marked by the match race between Scott Babbage and Mach 2 designer Andrew McDougall. McDougall built an immense lead over the rest of the fleet at the first weather mark but metre by metre, Babbage closed in on him pipping him at the post. In the fourth and last race of the day the shifting and dying breeze made it necessary for the Race Committee to shorten course at the bottom mark. Joe Turner dominated the Blue fleet from the outset while in the Yellow fleet Babbage had his worst result of the week so far. Although he was third at the top mark he slipped to 11th by the finish line. Although Thursday was initially scheduled to be a lay day, the race committee will try to hold two more qualification races starting at 1400 local time. Once again, the weather forecast is quite similar to what we have seen so far and as a result the Moths will have to fly in a light to moderate Ora breeze. Anthony Kotoun added: “I had a good day. The morning winds are usually not my strength and I’m not as good in the waves. It showed in the first where I led at the weather mark and then downwind went for a bunch of swims. I gained boats on the upwind but then lost on the downwind. I still finished tenth, which was much better than I thought. In the second race of the morning it got light, I sailed well and finished second. This afternoon upwind was my strength and I got a second and a third.